I am using a web view in which I am adding an image view. How can I set the background of this image view to transparent? Where trans → <color name="trans">#00000000 </color>. Two hexadecimal characters can be appended to any hexadecimal color code. The first two characters in an 8-digit hex color code represents its opacity in Android. Normal opaque black hex- "#000000"
This way you can change any color to any level of transparency. Divide the percentage number by 100 and multiply by 255 to get the decimal value. Convert the decimal to hexadecimal here. For example, for 50%, 50/100 * 255 = 127. Using the link we get hexadecimal value 7F. If you want to add 20% or 30% transparency, you should pre-pend two more characters to the hexadecimal code, like CC. where CC is the alpha value, FF is the red factor, 00 is the green factor, and 88 is the blue factor. Set opacity between 0 (fully transparent) to 255 (completely opaque). The 127.5 is exactly 50%. 16 |128          Where 128 is the half of 256. |8 -0         So it means 80 is half transparent. 16 |64            Where 64 is the quarter of 256. |4 -0          So it means 40 is quarter transparent. There is already a predefined constant. Use Color.TRANSPARENT. But I think you may want to make the background of the image that you are placing into the WebView transparent, for example, with a transparent PNG, rather than the ImageView background. If the actual image is not at all see-through then the ImageView background can't be seen through it. 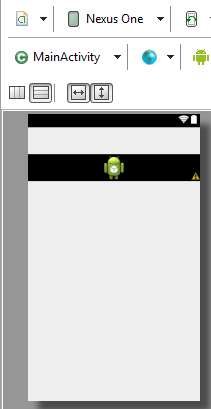 In your XML file, set an attribute "Alpha"
Another working option I came across is to set android:background="@null"
Its an fully transparent hexa code - "#00000000"
You could also use View.setAlpha(float) to change the visibility precisely. Try to use the following code. It will help you in full or more. Or you can set it programmatically as well. 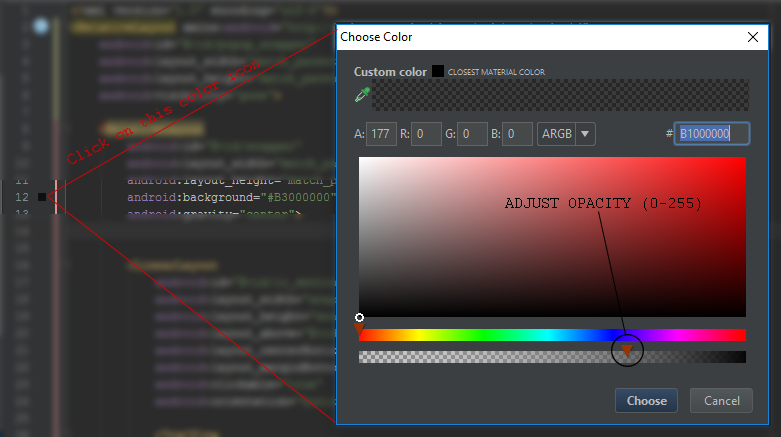 The color depends on your choice of which color you want to use for transparent. Mostly use a white or #FFFFFF color. Regarding R.drawable.llabackground: This line of code is for your style of the background, like something special or different for your purpose. You can also use this. For transparency 000000 = black, you can change these six numbers for the color you want. Not the answer you're looking for? Browse other questions tagged android android-widget or ask your own question. How to set transparency only background? How can I make an image transparent on Android? 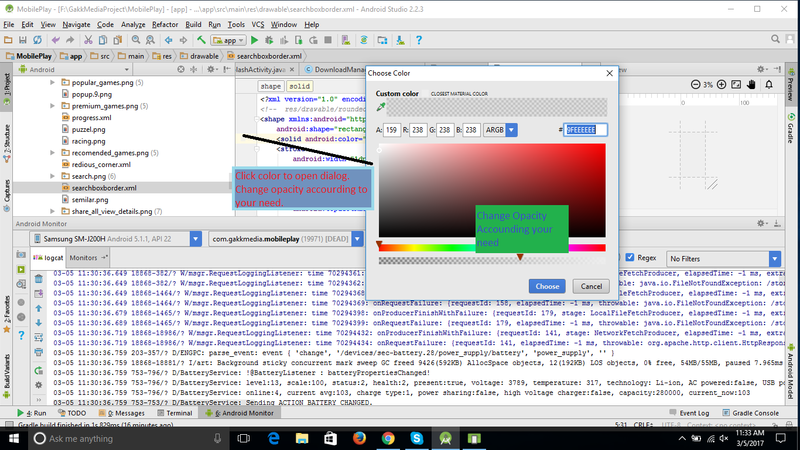 How to make text color as transparent in listview android? How to apply different colour filters on an image in android?